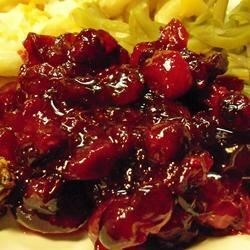 "This cranberry sauce is great -- it's tasty and incredibly simple to make!" In a microwave safe bowl, mix together cranberries, sugar and water. Cover the mixture with wax paper and microwave on high power until the cranberries pop (about 7 minutes). Chill before serving. See how to make a classic holiday cranberry sauce. I believe this is the same recipe you get on the back of a bag of cranberries. Still better than can.